Finally, affordable, free-breathing engine power is now available for Ford SuperDuty 6.7 Diesel owners. It's Now easy to Unlock your Ford 6.7 Powerstroke for maximum performance and get the power to pull, the power to haul and the power to pass. The factory intake system makes bringing air into your engine 300% harder! Let it breathe! Help your Ford Powerstroke Diesel to help you. Your 6.7 Powerstroke engine is basically a big air pump! The factory provides your Ford diesel with basic, low cost and relatively ineffective engine breathing/filtering capability. The factory engine air supply is designed to be a compromise of many criteria. 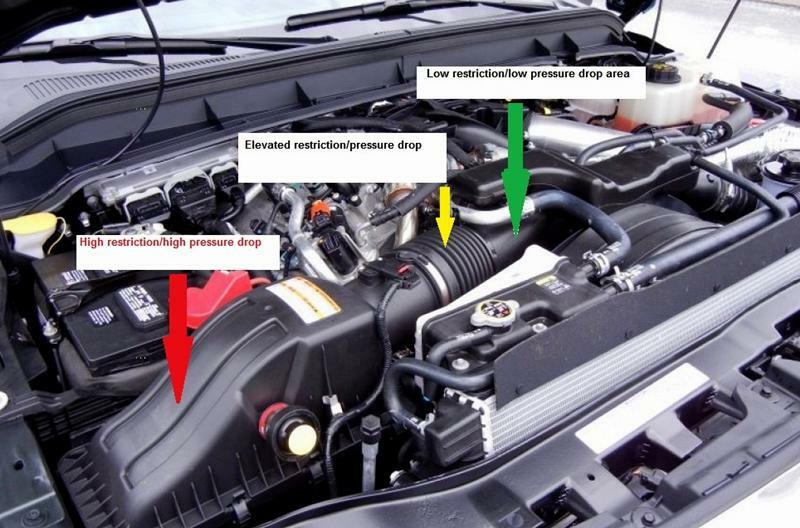 Through extensive analysis, R2C engineers have discovered the impediments to feeding your Powerstroke engine with the air it requires to perform at the highest levels. Now, this breakthrough, 2200 CFM Black Hex smooth tube technology allows your air pump to breathe all the cooler, cleaner air it needs! The factory engine intake system has a great deal of restriction. Almost 17" of water grains are required to move air into your engine during high demand driving. The OEM tube that attaches to the throttle body is an effective design when factoring the recess created for the hose that is routed above it. Pressure drop or flow restrictions are very low through this tube. The convolute tube that joins the polyethylene tube does increase the resistance to flow. Finally, the air box and panel filter are by far the most significant contributors in making the Powerstroke work harder than it should to intake air, which costs you power and efficiency. 10 Cubic feet of air................. per second! Yes indeed. Ford Powerstroke engines work hard and consume lot's of air. Think about how quickly that profile moves from inlet through the intake system! R2C engineers have reduced the total restriction level to 5.4" water grains on the manometer, a laboratory device which measures how hard your engine has to work just to bring in the air it requires to perform at maximum levels. The key design elements are the massive air filter and the air box design that allows over 22,000 CFM of outside air to reach the filter area at highway speeds. In addition, R2C Powerstroke systems include a smooth bore tube that eliminates the flow restrictions inside the rubber convolute tube and allows a smooth profile transfer into the factory polyethylene intake tube and finally, into the throttle body. The result of this effective, CFD generated design provides a system that offers less than one-third the restriction of the factory air supply system which translates to more power and improved efficiency and fuel economy. Remember, we have designed sophisticated, military diesel engine breathing systems for decades and now we can offer Ford diesel owners this advanced technology that separates R2C from every would-be "performance" company in this spectrum. We design and build "systems" and don't use off the shelf components. This system synergy integrates specifically designed components that include criteria such as correct tube volume and smooth, Computational Fluid Dynamics designed shape, intake temperature barriers and unlike others that rely on generic filter producing companies, we design and manufacture our Black Hex and Extreme Series filtration in-house. The R2C Black Hex Advantage - Don't forget, free engine breathing also makes daily commuting much easier on you and your Powerstroke engine. Since it works much less hard to bring in cooler and cleaner engine air, you benefit from this improved efficiency. Free breathing can pay for itself at the pump too! R2C Black Hex Powerstroke Engine Breathing Machines provide Ford diesel owners offer the most benefits! The best engine protection ever created for Ford truck owners - 99.981 ISO 5011 Fine Dust Rated Engine Protection! Outstanding under hood enhancement - Looks Great! Easy to install with simple hand tools - No modifications required. Simple maintenance - No oiling. Lasts as long as you own your truck for unmatched value. Severe-Duty Off-Road Extreme Series option - Stops and holds dirt to microscopic .3 micron levels, keeping engines spotless! Not eligible for use on vehicles registered in CA. Regardless of your lifestyle, there is an R2C Engine Breathing System that's perfect for you and your Ford Diesel Truck. *Black Hex Series System - for high performance and daily driving, towing, hauling and outdoor recreation and travel. *Extreme Series System - for the most grueling, nasty conditions your truck may encounter like severe dust, sand or silt. Don't pay more. 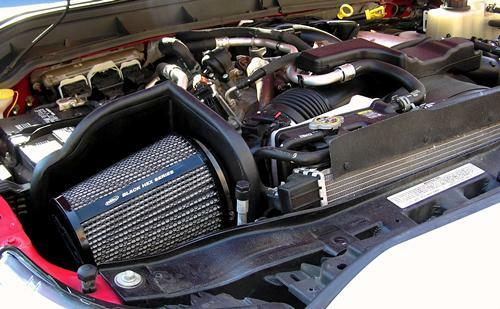 The best performing intake system you can buy for your Powerstroke is also the best value! Guaranteed to outperform any Powerstroke intake system available today!